Electric pump station is a power tool, you should carefully read all instructions, warnings and cautions before using, to comply with security measures to avoid damage to persons or equipment occurs when operating the equipment. Warning: Setting the maximum pressure is 63Mpa, non-arbitrary non-professionals regulated pressure valve factory prior to the pumping station. The Company unsafe operation and damage caused by incorrect operation irresponsible. Tip: Use the 46 # or 32 # hydraulic oil for the pump station. Electric pump station is a three-phase asynchronous motors, low voltage pumps, high pressure pumps, tank composed. 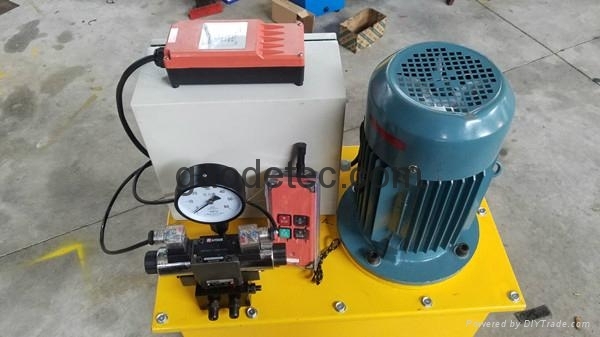 Small volume, high pressure, light weight, the advantages of simple structure, and it is equipped with pressure gauges connected to the standby interface.